Cowpox is a rare, mildly contagious skin disease caused by the cowpox virus, which has gained fame because of its use in the eighteenth century for immunization against smallpox, a deadly disease from the same family of viruses as cowpox. Cowpox received its name from milkmaids touching the udders of infected cows; however, today it is acquired most often from contact with an infected cat and is also known as catpox and the virus as catpox virus. The virus is found in Europe, but is very rare today. Infection in humans results in localized, pustular (producing pus) lesions at the site the virus enters the skin; death is very rare (Aguayo and Calderón; Levin 2007). The discovery of this nature-provided means of inoculating against smallpox led the way in elimination of a disease that killed an estimated 400,000 Europeans each year during the eighteenth century, and even an estimated 300 to 500 million deaths in the twentieth century before smallpox was completely eradicated. The cowpox virus is a type of Orthopoxvirus, a group that includes buffalopox virus, camelpox virus, monkeypox virus, rabbitpox virus, sealpox virus, volepox virus and Ectromelia virus, which causes mousepox. The most famous member of the genus is Variola virus, which causes smallpox. Members of the Orthopoxvirus taxonomic group are members of Poxviridae (poxviruses) and the subfamily Chordopoxvirinae, members of which exclusively infect chordates. As a member of the Orthopoxvirus taxon, cowpow is a double-stranded DNA virus that replicates in the cytoplasm of the cell (Levin 2007). The virus binds to receptors on the plasma membrane of host cells and enters the cytoplasm, where the DNA is replicated and new viral particles assembled (Levin 2007). These are released when the cell lyses and can then enter nearby cells (Levin 2007). The DNA does not integrate into the host cell and there is no latent stage (Levin 2007). The main reservoir hosts of the cowpox virus are rodents, but it can spread to cattle, cats, humans, and zoo animals, such as elephants and large felids (Aguayo and Calderón). The main reservoir hosts are woodland rodents, particularly voles and wood mice. It is from these rodents that domestic cats contract the virus. Humans, cattle, and cats are only accidental hosts (Levin 2007). Symptoms in cats include lesions on the face, neck, forelimbs, and paws, and less commonly upper respiratory tract infection (Mansell and Rees 2006). The cowpox virus is believed to be transmitted to humans by direct contact with an infected animal, with the virus entering through broken skin (Levin 2007). Although historically cowpox infection has been associated with transmission from cattle, from the infected teats of cows being milked, today it is most commonly acquired from domestic cats (Aguayo and Calderón). Generally infection remains localized at the site of infection, with infection producing pustular lesions where the virus enters the skin (Levin 2007; Aguayo and Calderón). Common sites for the lesions are the hands, the thumbs, the first interdigital cleft, and the forefinger (Aguayo and Calderón). Levin (2007) reports that there are usually only one or a small number of lesions on the hands (48 percent) and face (33 percent). The vesicopustular lesions on the hands or face subsequently ulcerate and develop a black eschar before regressing spontaneously (Levin 2007; Aguayo and Calderón). However, lymphatic spread and more generalized skin infection have been reported (Levin 2007; Aguayo and Calderón). Wider spread and death are rare (Levin 2007). The incubation period is nine to ten days. Cowpox in humans tends to be self-limiting, with the immune system able to control the infection and the only remnant being scars at the site of the lesions (Levin 2007). Human cases today are very rare. Fewer than 150 human cases have been reported, with most incidences having been reported in Great Britain, and smaller numbers of cases from Germany, Belgium, France, Netherlands, Sweden, Finland, Norway, and Russia (Levin 2007). The United States has had no reported cases of cowpox (Levin 2007). According to Vestey et al. (1991), cowpox virus infections between 1985 and 1990 were reported at the rate of approximately two per year, but they note that the actual incidences of the disease was probably considerably higher. 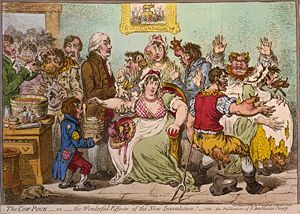 Caricature by James Gillray concerning vaccination with cowpox, depicting recipients of the vaccine developing cow-like appendages. The deadly smallpox disease is caused by the virus Variola virus, which is related to the cowpox virus. After infection with the disease cowpox, the body (usually) gains the ability of recognizing the similar smallpox virus from its antigens and so is able to fight the smallpox disease much more efficiently. The cowpox virus was used to perform the first successful vaccination against another disease when it was employed against smallpox. The credit for immunization against smallpox generally goes to Edward Jenner (1749-1823), who in 1796 inoculated against smallpox using cowpox. While Edward Jenner has been recognized as the first doctor to give sophisticated immunization, at least six other people before Jenner had independently tested the possibility of using the cowpox vaccine as an immunization for smallpox in humans, including Benjamin Jestey in 1774 and the German teacher Peter Plett in 1791 (Plett 2006). Two decades before Jenner's inoculation, British dairy farmer Benjamin Jestey noticed that "milkmaids" did not become infected with smallpox, or displayed a milder form. Jestey took the pus from an infected cow's udder and inoculated his wife and children with cowpox, in order to artificially induce immunity to smallpox during the epidemic of 1774, thereby making them immune to smallpox. It had been reported that farmers and people working regularly with cows and horses were often spared during smallpox outbreaks. Between 1790 and 1792, Plett (1766-1823), who recognized the wider importance of his discovery, reported his findings to the Medical Faculty of the University of Kiel, but the faculty disregarded Plett's reports and neither responded to them nor changed their preferred method, variolation (Plett 2006). Twenty-two years after Jestey, Jenner found that by injecting a human with the cowpox virus, the immunized human was then also immune to smallpox. Vaccination to prevent smallpox was soon practiced all over the world. During the nineteenth century, the cowpox virus used for smallpox vaccination was replaced by Vaccinia virus. Vaccinia is in the same family as cowpox and Variola, but is genetically distinct from both. After successful vaccination campaigns throughout the nineteenth and twentieth centuries, the World Health Organization (WHO) certified the eradication of smallpox in 1979. The word vaccination is variously attributed to the Latin root vacca, meaning "cow," or from Latin root vaccinia. The vaccinia virus now used for smallpox vaccination is sufficiently different from the cowpox virus found in the wild as to be considered a separate virus (Yuan 1999). In a famous letter to Meriwether Lewis in 1803, Thomas Jefferson instructed the Lewis and Clark expedition to "carry with you some matter of the kine-pox; inform those of them with whom you may be, of its efficacy as a preservative from the smallpox; and encourage them in the use of it..." (Jefferson 1803). Jefferson had developed an interest in protecting Native Americans from smallpox having been aware of epidemics along the Missouri River during the previous century. One year prior to his special instructions to Lewis, Jefferson had persuaded a visiting delegation of North American Indian Chieftains to be vaccinated with kinepox during the winter of 1801-1802. Unfortunately, Lewis never got the opportunity to use kinepox during the pair's expedition as it had become inadvertently inactive—a common occurrence in a time before vaccines were stabilized with preservatives like glycerol or kept at refrigeration temperatures. Aguayo, J, and J. Calderón. n.d. Cowpox virus Standford University. Retrieved July 31, 2008. Jefferson, T. 1803. President Thomas Jefferson's instructions to Captain Meriwether Lewis (June 20, 1803) College of Staten Island of The City University of New York. Retrieved July 22, 2016. Levin, N. A. 2007. Cowpox infection, human eMedicine. Retrieved July 31, 2008. Mansell, J. K, and C. A. Rees. 2006. Cutaneous manifestations of viral disease. In J. R. August (ed. ), Consultations in Feline Internal Medicine, vol. 5. St. Louis, Mo: Elsevier Saunders. ISBN 0721604234. Peck, D. R. 2002. Or Perish in the Attempt: Wilderness Medicine in the Lewis & Clark Expedition. Helena, MT: Farcountry Press. ISBN 1560372265. Retrieved July 31, 2008. Plett, P. C. 2006. Peter Plett and other discoverers of cowpox vaccination before Edward Jenner Sudhoffs Arch 90(2): 219–32. PMID 17338405. Vestey, J. P., D. L. Yirrell, and R. D. Aldridge. 1991. Cowpox/catpox infection. British Journal of Dermatology 124(1): 74-78. Yuan, J. 1999. The small pox story Standford University. Retrieved July 31,2008. This page was last modified on 22 July 2016, at 19:27.